One year ago I was sitting at work during the lull between Christmas and New Year’s without a whole lot to do (much like today). Inspired by the work of some awesome druid bloggers like Keeva, Beruthiel and Kae, I had been tossing around the idea of starting my own druid blog for a while but just couldn’t think of a good topic for a first post. Then I saw it: Miss Medicina’s Circle of Healers questionnaire. What better way could there be for a noobie blogger to start out? That’s when Cannot be Tamed was born. I think I started out a little rough. I never considered myself a writer (still don’t really), but I had some strong opinions on druids and I knew what I was talking about, so I wanted to share. My 5-part series on setting up a good UI. I love seeing other people’s UIs and it seems I’m not alone in that. This was my first post that got linked to on Wow.com and gave me my first real traffic spike. Ideas for Tree Form Cooldowns. As far as I can tell, this was my most popular post ever. It’s too bad none of my ideas got implemented, some of them were pretty awesome. My Favorite Raid Bosses was a post I had a lot of fun writing and it brought bad all kinds of good (and not-so-good) raiding memories. LFD: How to Fit In was also a lot of fun to write. I love to exercise my sarcasm muscles. Druid Fashion let Jasyla be a model for a day and gave me some experience with WoW model viewer. BTW, the winner of best druid gear? T8 – Nightsong! Comparison of Healing Spells by Class was enjoyable since I’m a big nerd and I love digging through Wowhead. I even learned some things I didn’t know about other healing classes. Other people seemed to like this post too. Over the past year I’ve written 154 posts, received 780 comments (half of which are my responses to others) and my site has been visited 57,000 times. I’m pretty happy with that and I want to thank a few people for making my blogging experience enjoyable. Thanks to Euripides at OutDPS!, Vixsin at Life in Group 5 and Virile at Rejuvo who were the first people to link to me. Thanks to Jen and Zelmaru, without whom I probably would have blown up my site by now. Thanks to all the bloggers who do a lot of work on improving the blogging community: those who work on Blog Azeroth (like Ophelie), those who create blogging events (like Angelya‘s easter egg hunt), and those who work to spread the word about new blogs and great new posts (like the fine folks at MMO Melting Pot) – you all make blogging a lot of fun and make bloggers feel special. And of course, thanks to everyone who subscribes to Cannot be Tamed, stops by to read and especially those who comment every once in a while – discussions and interactions with other WoW players is the best part of blogging. Max says thank you too. I’m feeling a little blogged-out recently. Not a whole lot is going on in game. Druid is plugging away at hard modes (currently 8/12), Hunter is working on normal 25s (10/12) and heroic 10s (7/12) when I can make the raids. I also recently got another character to 80. However, I seem to be suffering from a case of writer’s block and can’t think of anything I want to blog about right now. Kae at Dreambound talks about layout and positioning mods. Complete with cute stick figures! Ecclesiastical Discipline talks about designing a UI from scratch. Hots & DoTs shows off a shadow priest UI. The Huntsman’s Lodge provides Power Aura code strings for pretty much everything a hunter needs to know. I have borrowed quite a few of these myself. Lastly, while not strictly UI related (although there is a section on addons), Keeva at Tree Bark Jacket has created an awesome and extremely thorough guide to playing a resto druid. Everything you ever wanted to know about trees but were afraid to ask! In other news, the G20 is now over, but the city is a little worse for wear. I don’t want to get too politcal on this blog, but I’m rather disgusted at what happened over the weekend. The summit itself and any legitimate protesters were heavily overshadowed by a few hundred anarchist idiots who thought it would be a good idea to smash storefronts and set things on fire. These people weren’t even protesting anything, they’re just a bunch of malcontents with mother issues looking for an excuse to cause a ruckus. 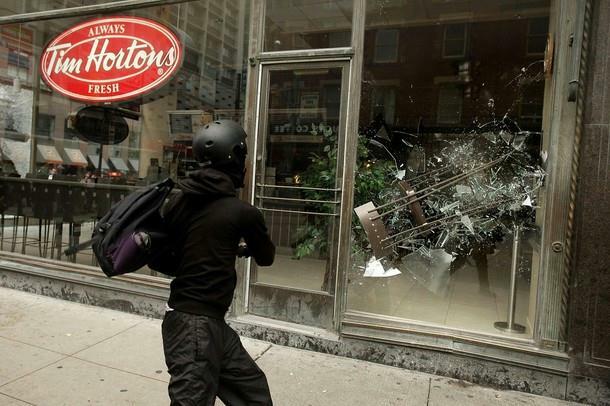 Note to any rabble-rousers out there: coming to Toronto and smashing up Tim Hortons is not going to make you any friends. I hope all the vandals are put in prison and quickly make friends with some large, angry, sexually-frustrated inmates. Here are some interesting blog posts I’ve come across in the last few weeks. Bellweather at 4Healz thinks that every healer should know more than just their job. I wholeheartedly agree! Divine Plea gives some good advice on handling on the fly changes in raids. Duct Tape and a Prayer makes me chuckle with a brief moment of levity. Looking for More gives some good advice about Tanking 101. Oddcraft serves up some lore to go along with the ever-controversial sparkle pony. Kae at Dreambound gives some advice from a druid. I jumped on the Disqus comment system bandwagon with Murloc Parliment and Revive & Rejuvenate after Zelmaru wrote about how easy it was to implement. I must say, I am impressed. It looks so much nicer that the yucky old Blogger comments. Everything looks to be running well and the old comments were all successfully imported. Feel free to kick the comment tires for me. My brain feels like mush and I am unable to come up with a post that is original or interesting. So instead, I’ll point you to some interesting posts by other people with non-mushy brains! Here are some of the posts I’ve found particularly useful over the last couple weeks. Beruthiel at Falling Leaves and Wings did a nice write-up on the information currently available on the resto druid 4T10 bonus. Although the bonus looked questionable at first, the data is showing that it’s actually quite strong. Time to start spending those emblems. Rilgon at Stabilized Effort Scope tells marksman hunters how to make the most of their Serpent Sting using the 2T10 bonus and trinket procs. Eidotrope at OutDPS has a complete how-to guide on how to tank Keleseth in the Blood Princes encounter as a hunter. Frostheim at the Warcraft Hunter’s Union has some excellent advice on how to increase your dps. I particularly like the part about spamming your buttons vs. using Quartz. The Glaivecow writes an open to letter to dps about how to know when it’s time to aoe.